Modern landscape’s new jewel! Inspired by the geometric patterns currently shaping contemporary design, the Diamond paver introduces this trend to urban outdoor spaces. 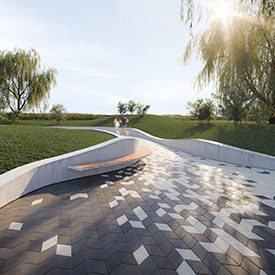 Its shape — paired with the color and texture options — make it one of the most creatively flexible modern-style pavers for both residential and commercial use. Our game-changing HD² technology (high definition and density), ensures the smoothest smooth and looks that will last. The sky is the limit when building outdoor floors inspired by chevron, zig-zag, cubic illusions and much more.